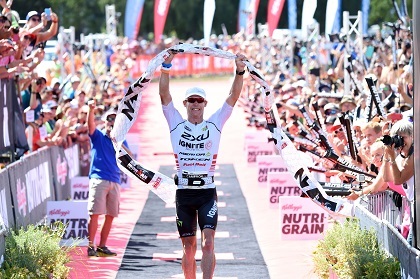 Cameron Brown, honoured in the New Year’s Honours List, will look to further his world records after being awarded number one seeding for the 33rd Kellogg’s Nutri-Grain IRONMAN New Zealand in Taupō next month. Brown, 44, FROM Dannemora, is chasing his 13th victory in Taupō and a win will extend his global record for the most wins of the same IRONMAN event and the oldest male to win an IRONMAN. He will take on a power-packed line-up on Saturday March 4, with the professional men’s field announced this week. Meanwhile top seed in the women’s race is American Meredith Kessler, who will chase a sixth straight victory in Taupō to equal the six wins in a row by New Zealander Joanna Lawn. The 2014 IRONMAN New Zealand champion, Marko Albert from Estonia, returns as the second seed ahead of Kiwi star Terenzo Bozzone, the 2008 IRONMAN 70.3 World Champion, who achieved his IRONMAN breakthrough with a course record win in Western Australia in December. Fourth seed is Belgium’s Marino Vanhoenaker, the 2012 Taupō winner in the weather-shortened race, who has 14 IRONMAN victories to his credit including a then world’s best time of 7hr45min in Austria, a race he has won eight times. Fifth seed is Frenchman Cyril Viennot, eighth in Taupo last year, but with a win in IRONMAN UK to his credit. There are a number of talented Kiwis in the field including double IRONMAN 70.3 Taupo winner Braden Currie, who will make his IRONMAN debut just a few weeks after finishing runner-up in the Coast to Coast multisport event, which he has won three times. Ironically, he will come up against the Coast to Coast winner Sam Clark who returns to join 25 male professionals confirmed for the race. Kessler has 11 IRONMAN wins to her credit after another outstanding year in 2012, as she returns to her regular starting race in Taupo, which has become second home for her and her husband. Second seed is Australian Carrie Lester, who enjoyed a top-10 finish at the IRONMAN World Championship, after wins at Chattanooga and Cairns. Colourful Netherlands triathlete Yvonne van Vlerken is seeded third on the back of seven IRONMAN victories and nine podiums including runner-up in Hawaii in 2008. There will be plenty of support for outstanding Australian Annabel Luxford, the fourth seed, who has been almost unbeatable over the IRONMAN 70.3 distance but still chasing a breakthrough victory over the full distance. There are a number of leading chances in an impressive women’s field including IRONMAN Louiseville winner Kate Bevilaqua (AUS), Great Britain’s Laura Siddall, fourth last year, and IRONMAN winners Yvette Grice (GBR) and Jocelyn McCauley (USA). There are 1200 entries from 49 countries entered, with the professionals chasing a prize purse of approximately $NZ115,000, while the age group competitors vie for 40 qualifying spots for the 2017 IRONMAN World Championship in Hawaii.